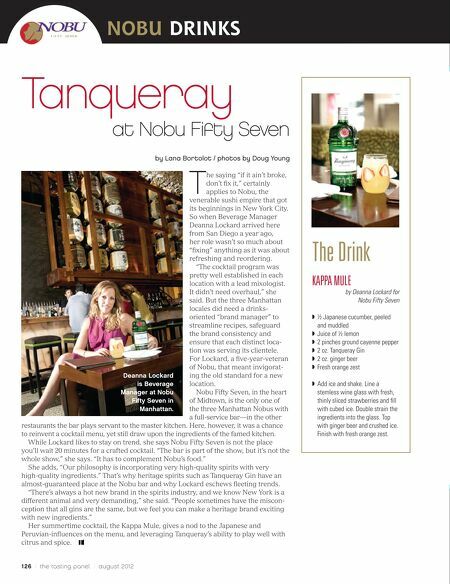 NOBU DRINKS Tanqueray T at Nobu Fifty Seven by Lana Bortolot / photos by Doug Young he saying "if it ain't broke, don't fix it," certainly applies to Nobu, the Deanna Lockard is Beverage Manager at Nobu Fifty Seven in Manhattan. venerable sushi empire that got its beginnings in New York City. So when Beverage Manager Deanna Lockard arrived here from San Diego a year ago, her role wasn't so much about "fixing" anything as it was about refreshing and reordering. "The cocktail program was pretty well established in each location with a lead mixologist. It didn't need overhaul," she said. But the three Manhattan locales did need a drinks- oriented "brand manager" to streamline recipes, safeguard the brand consistency and ensure that each distinct loca- tion was serving its clientele. For Lockard, a five-year-veteran of Nobu, that meant invigorat- ing the old standard for a new location. Nobu Fifty Seven, in the heart of Midtown, is the only one of the three Manhattan Nobus with a full-service bar—in the other restaurants the bar plays servant to the master kitchen. Here, however, it was a chance to reinvent a cocktail menu, yet still draw upon the ingredients of the famed kitchen. While Lockard likes to stay on trend, she says Nobu Fifty Seven is not the place you'll wait 20 minutes for a crafted cocktail. "The bar is part of the show, but it's not the whole show," she says. "It has to complement Nobu's food." 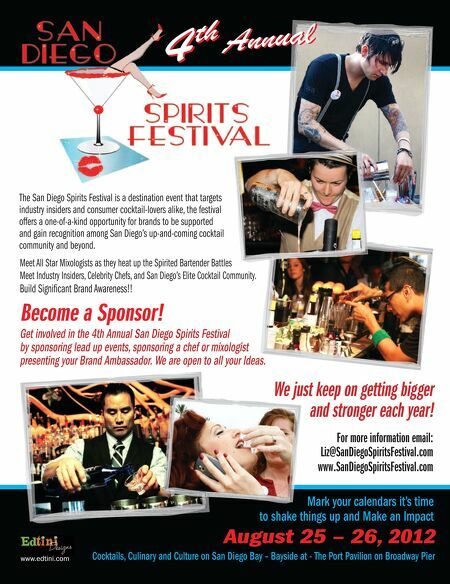 She adds, "Our philosophy is incorporating very high-quality spirits with very high-quality ingredients." That's why heritage spirits such as Tanqueray Gin have an almost-guaranteed place at the Nobu bar and why Lockard eschews fleeting trends. "There's always a hot new brand in the spirits industry, and we know New York is a different animal and very demanding," she said. "People sometimes have the miscon- ception that all gins are the same, but we feel you can make a heritage brand exciting with new ingredients." Her summertime cocktail, the Kappa Mule, gives a nod to the Japanese and Peruvian-influences on the menu, and leveraging Tanqueray's ability to play well with citrus and spice. 126 / the tasting panel / august 2012 The Drink KAPPA MULE by Deanna Lockard for Nobu Fifty Seven ◗ ½ Japanese cucumber, peeled and muddled ◗ Juice of ½ lemon ◗ 2 pinches ground cayenne pepper ◗ 2 oz. Tanqueray Gin ◗ 2 oz. ginger beer ◗ Fresh orange zest ◗ Add ice and shake. Line a stemless wine glass with fresh, thinly sliced strawberries and fill with cubed ice. Double strain the ingredients into the glass. Top with ginger beer and crushed ice. Finish with fresh orange zest.